You may be surprised to know that the majority of cats over the age of 12 years have some degree of arthritis and many cats have quite advanced arthritis by the time they reach their senior years. Arthritis involves a gradual deterioration of articular cartilage within the joints. This gradual deterioration causes secondary inflammation. This is a painful process and cats act completely different from dogs when reacting to pain. They often only give subtle clues that they are painful. Signs of pain from arthritis can show as any or a combination of the following: avoiding jumping or stairs, changes in posture, lack of grooming or over-grooming, a change in behaviour such as vocalization, aggression, decreased appetite, moving up from or down to a lying position more slowly, limping, walking more slowly, inappropriate urinations and/or constipation. These signs are not specific to arthritis and can be due to other conditions so the first step would be to have any cat showing these signs assessed by a veterinarian. There are many things we can do to alleviate the pain from arthritis and slow down the progression of the aging process in the joints. Maintaining an ideal weight is important, therefore a weight reduction program for overweight cats should be carried out. This is best done with the help of a veterinarian and clinic staff as it has be a cautious process with regular weight monitoring to ensure cats are losing weight at an appropriate rate (too fast can be risky). There are specific foods which promote weight loss in cats by restricting calories but also maintaining levels of important nutrients. 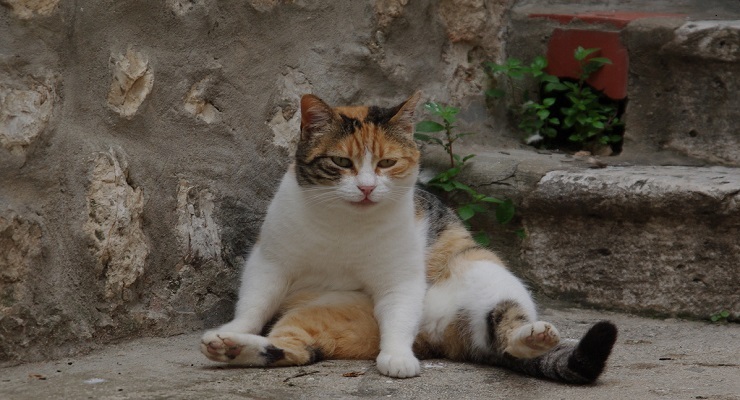 For cats that are already at an ideal weight there are foods specifically formulated to improve mobility and reduce the progression of arthritis in cats. There are many things that can be done in the home to help cats that have arthritis. Often cats with arthritis have difficulty getting in and out of the litter box. Using litter boxes that are very low to the ground would be ideal such as a boot tray. Moving the litter box to an easy to get to area or having multiple boxes in different areas of the house is great too. Keeping cats active is important and providing regular sessions of indoor activity/play time using toys help keep joints mobile. Also some cats are too sore to get up and find their food and water bowls so moving these to an easily accessible area as well as having water bowls in multiple regions of the house is a great way to improve water consumption. Cartrophen is a medication given by injection under the skin and shown to be effective in controlling the destruction of cartilage. It works by improving blood supply within the joints, preventing some of the harmful enzymes that continue the destruction of cartilage and promotes the formation of fibrous tissue to heal damaged areas. It is given initially once weekly for 4 weeks then maintain with an injection once every 1 to 2 months. Glucosamine/Chrondroitin are dietary supplements and components of cartilage that the body can use to repair and rebuild cartilage when it is damaged. They also have mild anti-inflammatory properties. It is best to use a cat specific product from a reputable company since the quality of these products can vary tremendously. There are different kinds of oral medications as well that can be prescribed and used to alleviate pain from arthritis in cats. These are easy to give and improve mobility and quality of life for many cats. Please do not hesitate to call us if you feel your cat may be showing signs of arthritis.